Electro-pop singer Owl City and synth-tinkling LIGHTS will be going on tour beginning in March, but with the first half of ticket dates already sold out, the pair have added more dates and states to the line up. The tour kicks off March 30 in Boise, ID, and will travel to 24 cities on the road trip, which winds down May 2 in Milwaukee, WI. 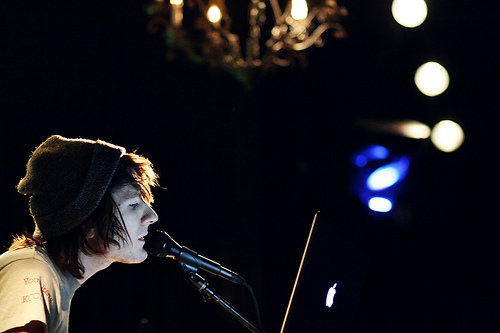 Check here to see if Owl City and LIGHTS are coming to an arena near you! LIGHTS latest music video for her single, “Ice” where her alter-ego’s of ice and fire battle it out! Keytar-wielding synth-pop sensation, LIGHTS, is currently starring in Audio Quest: A Captain LIGHTS Adventure. The first episode of the ten-part short-form motion comic series premiered on MTV and three further episodes have now been released, following Captain LIGHTS on her galactic adventure to restore sound to the universe. Audio Quest is a natural evolution for LIGHTS – a talented visual artist herself, who remains no stranger to science fiction and the world of comics. Featuring artwork of renowned visual artists, Tomm Coker, Audio Quest remains a stunning visual expression of a gifted pop star’s point of view. Experience the adventure and check out all episodes of Audio Quest: A Captain LIGHTS Adventure here! Toronto singer, songwriter Lights is giving us a copy of her debut album, The Listening, via Warner Bros. Records, for a lucky reader! All you need to do in order to enter the contest is leave a comment on this post with one example of why you like LIGHTS and you will be instantly entered in the raffle. Please provide a valid e-mail address as it will be our means of contacting the winner. E-mails will not become public, nor recieve spam messages. The contest runs through October 31st with the winner being notified November 1st either via e-mail. Good luck! Lights Debut Album, “The Listening” Drops This Week! Her first full collection of music, The Listening, expands on her sound, which she calls “inter-galactic electro” and describes as “simple lyrics juxtaposed with sounds harvested from the far reaches of my alternate universe.” The album includes a few songs already familiar to die-hard LIGHTS fans, as well as plenty of new material including the first single, “Saviour,” a propulsive pop anthem that represents her charming musical essence. In celebration of her forthcoming debut, fans can now exclusively stream her latest EP via Myspace.